things that make me happy! 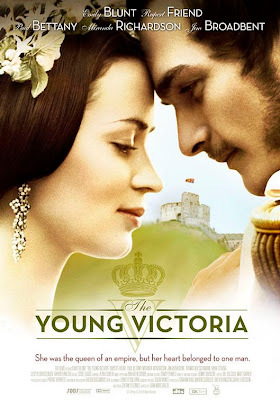 : I like "The Young Victoria"
I like "The Young Victoria"
Always have a soft spot for those movies of kings & queens, duke and duchess type of era. So borrowed this movie "The Young Victoria" to watch last nite and i love love love it! Its a relatively easy plot to follow and based roughly on the life of Queen Victoria - queen of great britian , the longest reigning britsh monarch. A synopsis - "A dramatization of the turbulent first years of Queen Victoria's rule and her enduring romance with prince albert". Catch it if you like such shows too. I also like "The Other Bolyen Girl" , "The Duchess" and the likes of these type of shows.